This badge holder understands the core technologies of IBM Cloud Private: Containers, Docker, Kubernetes, Helm and Cloud Foundry. The earner understands how IBM Cloud Private supports choice in application development with Kubernetes, Cloud Foundry, and function-based programming models. 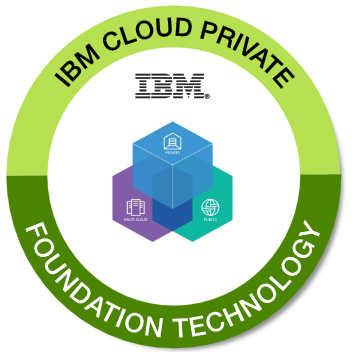 Successfully complete the IBM Cloud Private Foundation Technology Quiz with a score of 80% or higher. Depending on your background you should take some or all of the Optional Education listed below in order to earn this badge. Optional - Take the course IBM Cloud Private Foundation Technology Series: Containers and Docker. Optional -Take the course IBM Cloud Private Foundation Technology Series: Kubernetes and Helm. Optional -Take the course IBM Cloud Private Foundation Technology Series: Twelve-factor, Microservices, and Istio. Optional -Take the course IBM Cloud Private Foundation Technology Series: Containers and Docker Cloud Foundry.